The 21st Century Learner has many attributes that have been brought on by technology. There is instant information available from anywhere, and it is everywhere. No longer is there a need to go to a place to find, discover and learn. No matter where they are, they are connected to the world. According to Scholastic Library Publishing in their 2016 Edition, librarians and their programs raise student achievement by the librarian who supports collaboration, co-teaching and technology access. In order to have maximum impact, libraries need to provide collaborative programs; provide resources to meet the learning needs of all students; assure seamless integration of technology, teaching and learning; and encourage students to independently seek, access and utilize information. The social environment today is interconnected to learning. This evolution has positive and negative elements. It is however here, and it influences our environments. Students have integrated the process of learning with their social lives. With this integration, the existence of library environments of the past just does not fit. Some have termed it “The Silent Temple”. This place used to be the one resource where you got what you needed and then left. Today’s learning environment is multifaceted, interactive, and collaborative in a multi-tasking generation. The learning environment of today must address this technology borne behavior, and if done supportively, it can be an asset to learning. Gone is the day where the teacher sits in front of the classroom and lectures. This is now the day of collaborative, self-directed learning, where the teacher is the coach, and research, study, communication and collaboration take place all at the same time. Digital literacy is at the center, and it is digital literacy and addressing the way learning takes place that is changing the needs of libraries today. Due to technology and the resulting behavior patterns that have developed, public and private learning take place simultaneously. Students learn privately alone, privately as a group, alone in the presence of others and together in collaborative group atmospheres. The Library or Learning Commons serves that need. It should have a place for books of all kinds and a place to quietly work individually. But it should also have a place for collaboration, making things, and meeting as a group. It is a social environment that will attract learners and reinforce interaction and collaboration. The Learning Commons could have the laid-back feel of a coffee shop and could support and address self-directed learning, sharing knowledge and teamwork. 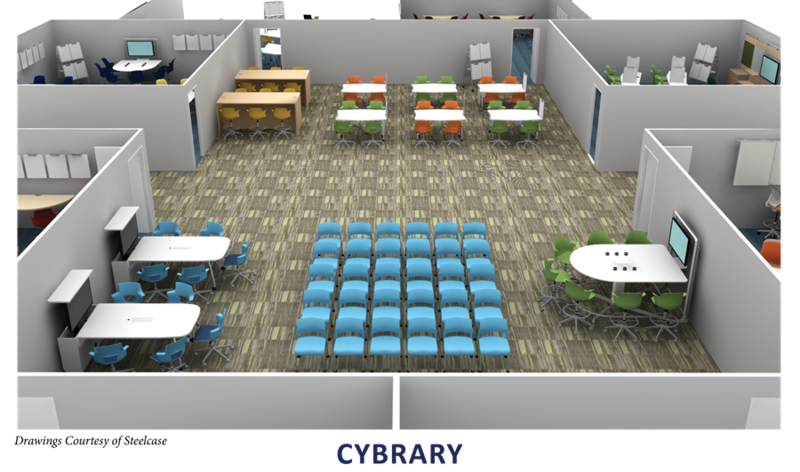 In the conversion of an existing library to a 21st Century Learning Commons, a school could partially erase the boundaries of the media center and set up that “Coffee Shop” feel that would attract students and therefore collaboration. Within the Library Commons, books would remain, yet high powered digital wireless access could be prevalent. 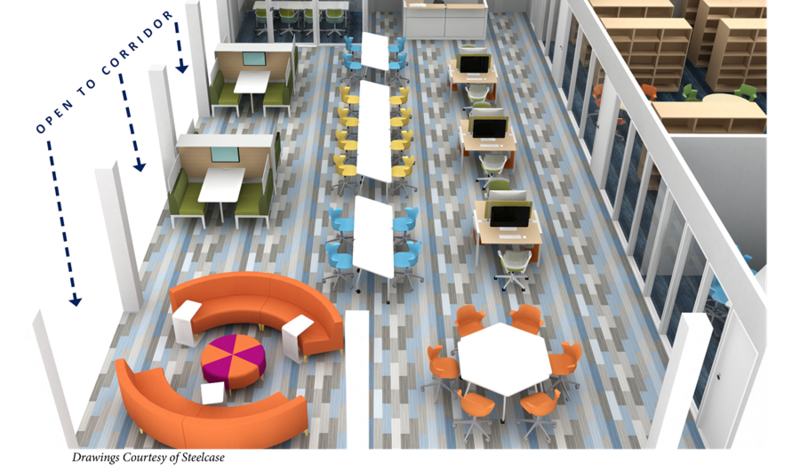 Informal spaces could be identified for research, and lounge seating could be available. Meeting space for teamwork and collaboration could be available, and computer stations could be distributed throughout the area for ease of access. A maker space could be developed and used for special projects. The entire facility could be as transparent as possible for observation purposes, but more importantly, to exhibit to passersby the activity and energy that is on-going. Such an approach not only activates the learning commons, it mentally activates those who are observing. To create such an atmosphere makes learning contagious. If there is an opportunity for new space, the approach could be a little more radical. The notion that a library is there for use by the school population, where students go to the library for all research activities, seems to be outdated. 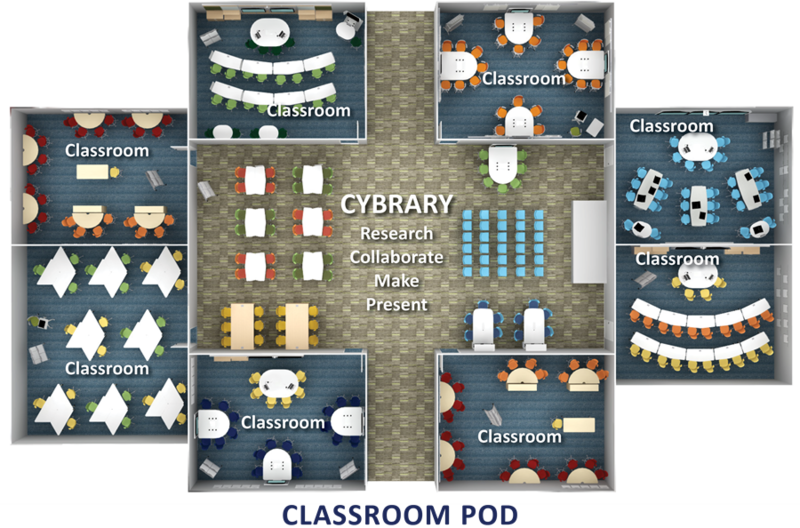 Rather than the students interfacing with the library commons and the librarian, it is suggested that the space be partially redistributed to classroom pods as research, study, collaboration and presentation space, a Cybrary, if you will. A cybrarian is defined “as a librarian or researcher who uses the internet as an information resource”. To coin the term Cybrary as the descriptor for this new space type is only appropriate. It is defined as “an online collection of reference material; a library that provides electronic access to reference material”. In this way, the action is reversed, and the librarian becomes a coach of research and collaborative activity, who goes to the students. 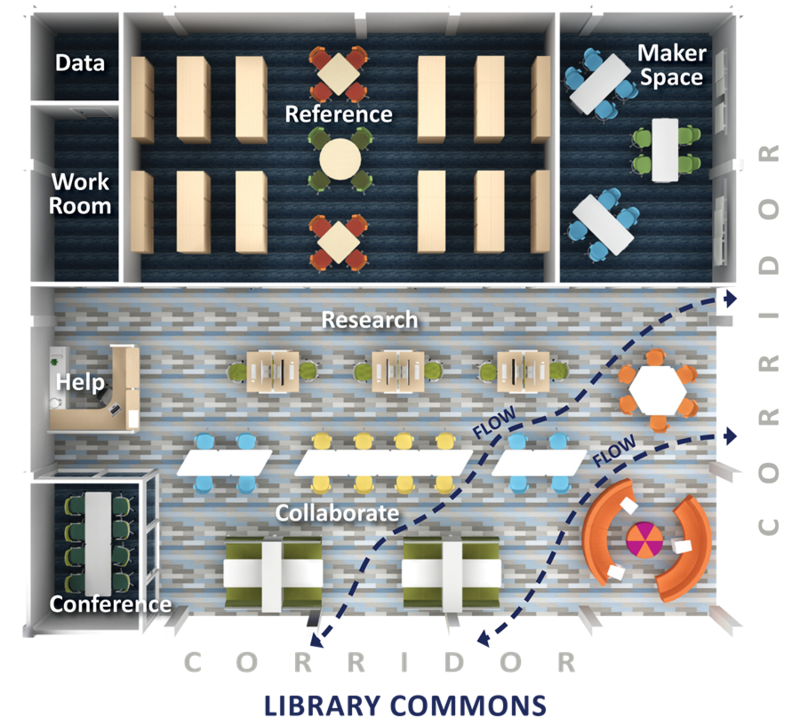 The main library commons could stay in place to allow access to research materials, a maker space (if not part of the classroom pod), and a primary help desk. If the budget will allow, a common coffee shop-type lounge space with digital access would also be appropriate for the main library commons. Michael Holly is the Founder and Principal Architect at Holly & Smith Architects. He is a member of the AIA Committee on Education and is currently serving as the Governor of the Louisiana Chapter of the Association for Learning Environments (A4LE). Michael is certified as a Recognized Educational Facility Planner (REFP), and he is one of only two carrying that recognition within the State of Louisiana.